Cleaning and sanitizing of public restrooms is an important problem worldwide, which has not found yet an optimal solution. Cleaning means removing the visible dirt from all surfaces, while sanitizing means removing not only visible dirt, but also invisible elements like bacteria, which can be responsible for disease transmission. This means that even after cleaning, a truly clean washroom should be periodically sanitized. Santoemma RESTROOM Cleaning and Sanitizing Program provides innovative and patented systems for cleaning and sanitizing public restrooms of any size. By using specially designed machines, instead of manual work only, restrooms are completely cleaned and sanitized in a short time, with excellent and granted results. It is finally possible to reach a higher level in restroom’s hygiene, increase productivity and have a higher fulfilment of the cleaning operators. Specific systems and machines have been developed by Santoemma, in order to better suit any area, according to the type and dimensions of the restrooms to be cleaned and to their optimal cleaning and sanitizing plan. 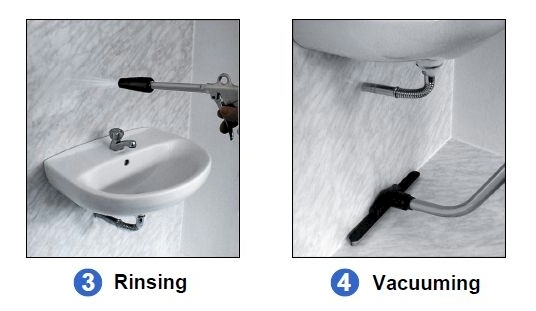 This system consists in using a unique machine to spray all the surfaces with a chemical solution, rinse the surfaces after few minutes and vacuum all the residual liquid from floor, leaving the room clean, sanitized and dry. 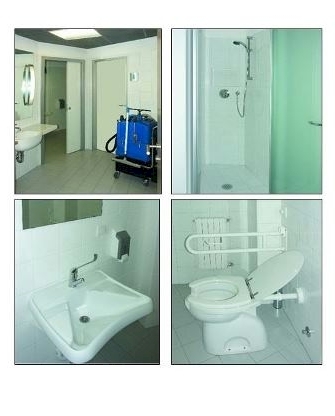 This system is suitable to clean and sanitize small and medium-size restrooms. 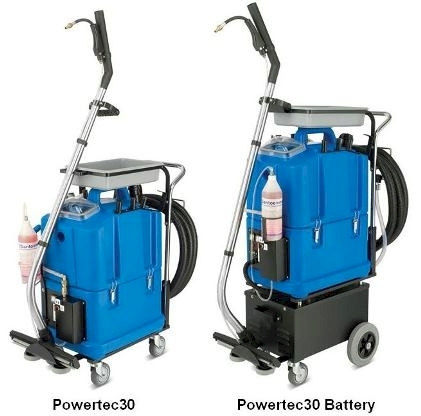 Two models are available: Powertec30 (cable powered) and Powertec30 Battery (battery powered). 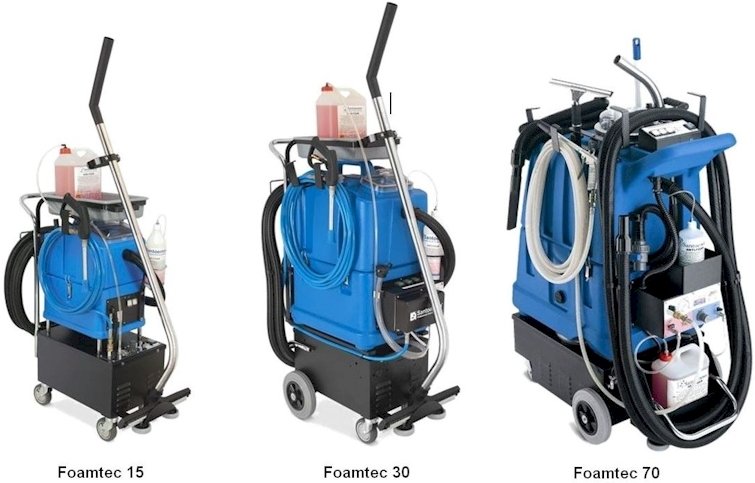 Foam-Rinse-Vacuum system was developed and patented by Santoemma as a revolutionary system to clean and sanitize public restrooms, by foaming, rinsing all surfaces and vacuuming, using a single machine. Foam ensures an extended chemical action on the dirt and bacteria and is therefore ideal for many places which need an heavy duty action. Vacuuming of residual liquid from floor. Three different models have been developed, with different capacities and autonomies, in order to adapt to places of different sizes. Better cleaning and sanitising result : foam does not immediately fall onto the floor, but stays on the surfaces where it has been sprayed for some minutes. The foam prolonged action assures to make the most of the cleaning effect of the product, ensuring both cleaning and sanitizing effect. 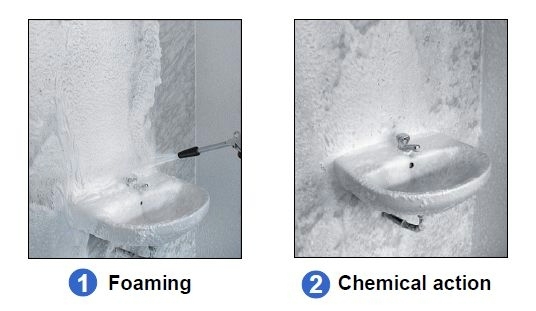 Visual effect of foam: foam covers in white all the surfaces where it is sprayed such as walls, sinks, fixtures. The operator can therefore check that every corner has been covered, for a complete action in every point. The greatest hygienic safety for the worker , who does not come in contact with the surfaces and the objects to be cleaned and who does not get wet by the bouncing water, because rinsing is done with low pressure. Reduced labour for the worker : manual work is reduced to a minimum since the dirt is removed by the chemical action of foam and the mechanical action of rinsing. This system, more comfortable and hygienic, gives a greater fulfilment to the worker. Saving of time : while foam acts on the surfaces where it has already been sprayed, the worker is free to operate on other surfaces. Therefore, even a big room can be completely cleaned quickly and with no idle time. Detergent saving : the chemical is used without waste because it does not immediately fall onto the floor. Reduced power consumption : the machine requires little electrical power and therefore it can be used in any place. Reduced water consumption : the system foam + rinse at low pressure requires a minimal quantity of water. This avoids the flood of rooms, allows a longer working autonomy and offers the immediate availability of the rooms that have been cleaned. The machine can be used also in places with no drains because it can completely vacuum the water remaining on the floor after rinsing. 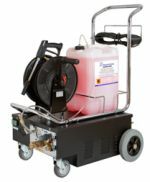 IdroFoamRinse is an innovative machine, electrically powered, allowing to spray foam and rinse continuously. The water used for foaming and rinsing is directly taken from the water network, therefore the machine has an unlimited autonomy. Pure chemical is contained in its separate tank, having a volume up to 25 litres, and it is automatically used by the machine in a controlled quantity. IdroFoamRinse is indicated to clean all the areas where the presence of a drain in the floor makes vacuuming not necessary, such as for example: showers, saunas, swimming pools, camping grounds. Santoemma developed a simple but complete range of chemicals, suitable to perform specific actions. Laboratory tests certify that the application of Santoemma chemicals on a surface for 3 minutes allows to kill 99,9% of specific bacteria, confirming the effectiveness of their sanitizing action. SANI-FOAM is a specific chemical for maintenance cleaning and sanitizing. It leaves a pleasant scent in the rooms. SUPER-FOAM is a strong degreasing chemical, with high pH, for restoration cleaning and fat removal. ACID-FOAM is an acid chemical which can be periodically used to remove lime from showers, sanitary fixtures and other surfaces. 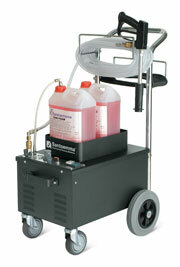 All the machines are provided with the necessary accessories allowing to spray/foam, rinse and vacuum. According to the model, other accessories are supplied as standard or optional, such as: pane wiper, floor wiper, fleece. All the accessories can be stored on the machine, so they can be easily used and carried. Thanks to a special accessory put on the floor, it is also possible to start vacuuming the liquid from floor, while the operator is rinsing. In this case, the wet vacuum tool is used in the end to dry the floor completely.